Mr.Shih talks about application and market trend of BIPB with manager Mr. WenweiShan, president Mr.XiaoyongXiong, vice manager Mr.Hongzhuan Zhan and middle management of Hunan Yixiang Chemical. 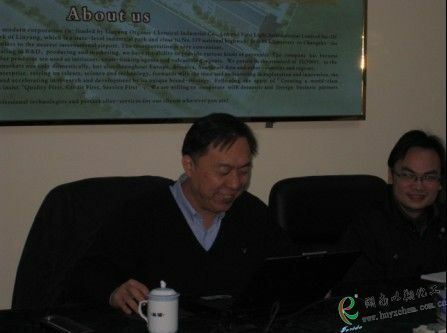 On Feb.4,2010, Taiwan client Mr.Shih visited Hunan Yixiang Chemical Industrial CO.,ltd. He discussed promoting plan in Taiwan BIPB market. With our invitation, Mr. Shih talked about application of crosslinking agent and BIPB worldwide market trend. Mr. Shih talks about worldwide market trend. This visit strengthened our friendship and laid the foundation of exploiting Taiwan BIPB market.